What are your professional learning plans for the summer? Congratulations! It’s through your support and passion to make a difference to students’ that we celebrate another successful year of learning. Our Summer Professional Learning Edition is a reflection of you--a collaborative collection of knowledge sharing through our vast network of incredibly dedicated and innovative education and industry leaders from across Canada and beyond. Thanks to the power of Web 2.0 technology we’ve made our vast country seem like a close knit of community leaders and learners. Thank you for inspiring us to deliver transformational digital learning experiences through our enhanced service offering. I want to especially thank our team, advisory board and sponsors who share mutual goals that ultimately support student success. Congratulations on a successful year. Until next time, enjoy your summer and keep the learning curve steep! P.S. This month's issue is dedicated to my mother, Giovanna Martellacci, who passed away recently. I will always be greatful for her love and support that enabled me to pursue my dreams. A perfect evening to Connect: EdTech education and industry leaders from across north america gathered to celebrate and connect connect atop the Omni rooftop terrace in San Diego where Mindshare Learning co-hosted its 4th Annual Can/Am partnering reception with the Consulate of Canada in San Diego. While I could not attend due to a family emergency, I greatly appreciated the support of our team Aislinn Malszecki, and Joseph Romano who stepped up, along with Christina Burke and Mario Diez from the Canadian Consulate of San Diego to make the event a success. Special thanks to Dr. Camille Rutherford, MindShare Learning advisory board for stepping in to MC the event on my behalf. I understand you were awesome! Enjoy the pix below that capture the evening’s highlights. R.M. 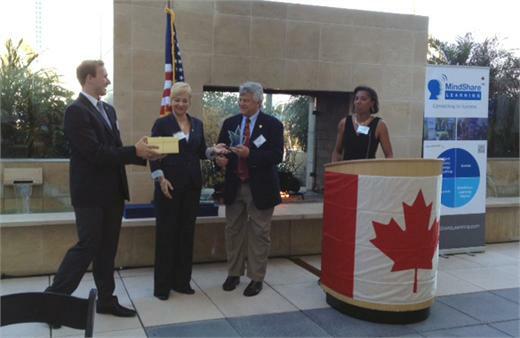 ISTE CEO Don Knezek was awarded Mindshare Learning’s Pinnacle Award yesterday during the Canadian/American partnering reception at ISTE 2012. Dr. Camille Rutherford, associate professor of education at Brock University and MindShare board member, presented the award, which recognizes Knezek’s long-time commitment to improving global education through effective learning technology. “Watching the winners of the Mindshare Learning 21st Century Classroom Video Challenge interact with Canadian consul, Lisa Stockley at the Mindshare Learning Can/Am reception, highlighted the commonalities in the work that the Canadian Consulate and Canadian educators perform. All three of the award winners were involved in projects that not only supported 21st century teaching and learning, but like the consulate, they also served to support global citizenship, international partnerships and enhance Canada's international reputation. Being a part of this unique event was a great opportunity to witness the impact of the Canadian education system can have on the rest of the world." Engaging as a part of the International Society for Technology in Education (ISTE) is “a powerful and meaningful way for educators to connect with peers, to gather in a variety of forums to share the challenges and excitement of teaching, and to be part of a community that leads the transformation of education.” After attending the 33rd annual ISTE Conference this past June in San Diego, California, it became clear to me that as a whole, professional development is redefining itself in the face of a revolutionary pedagogical shift. The International Society for Technology in Education (ISTE) is the premier membership association for educators and education leaders engaged in advancing excellence in learning and teaching through innovative and effective uses of technology. ISTE is the trusted source in education technology for professional development, knowledge generation, advocacy, and leadership for innovation. 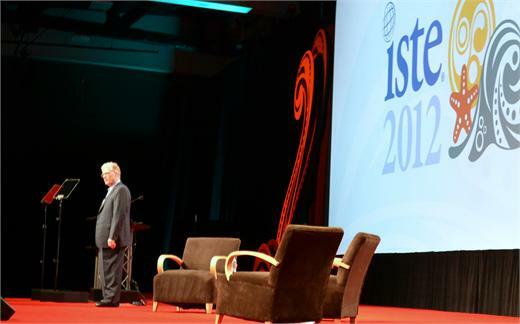 For more than three decades, ISTE's annual conference and exposition has been a gathering place for ed tech professionals to experience professional development, global networking, and to learn about industry trends. Of the 13,000 participants who attend ISTE's conference each year, nearly 40% are administrators, technology facilitators—leaders in educational technology from around the globe. Check the demographics below to find out more about our conference attendees and exhibitors. After attending some 25 plus conferences this past academic year, the B.C. ERAC was a perfect ending to the school year. The focus on student-centered learning reinforced for me what it’s all about when it comes to integrating technology. That, coupled with Dr. Fuallan’s new book and the blending of pedagogy, change leadership, and technology, provides great food for thought over the summer. Take a moment to tune into awesome podcast interviews with keynote presenter, Jay Collier, and two amazing Canadian thought leaders, Neil Stephenson, and Gary Kern, who also presented at the IT4K12 Conference. If you know an upcoming conference that you’d like us to sponsor, attend, or present at, please drop me a note. Save the date for our 3rd Annual EdTech Leadership Summit--Connecting2Success in Today’s Classroom, November 7 at York University. Cheers, R.M. P.S. 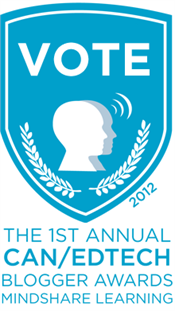 Although I missed ISTE, I followed the twitter feed #ISTE12 that contains some amazing content. Whitehorse – If you go to the 2012 Yukon River Quest website and click on “Race Tracker” you’ll find the result of three years planning, testing and programming by Yukon-based software programmer Peter Coates. Scientists from the University of Guelph, led by Jayasankar Subramanian, have teamed up with researchers from the Tamil Nadu Agricultural University in India, and the Industrial Technology Institute in Sri Lanka, to develop an innovative packaging system that uses state-of-the-art nanotechnology to reduce post-harvest losses in mangoes, a vital fruit crop in South Asia. Three things I learned about bullying at PREVNet’s 6th Annual Conference in Toronto on June 19, 2012. 1. "Silence is participation." One of the pledges from Travis Price’s Pink Shirt Day (pinkshirtday.ca), where Canadian teens commit to wearing pink for a day in February to help stop bullying. 2. Bullying is bad for the brain. It has the potential to change and damage the brain, causing lifelong consequences from stress says professor Jean Clinton from the dept. of Psychiatry and Behavioural Neuroscience at McMaster University. 3. Bullying is a relationship problem. Relationship problems require relationship solutions. A reminder from one of Canada’s leading bullying experts, professor Wendy Craig of Queen’s University. The Copyright Consortium of the Council of Ministers of Education, Canada (CMEC), responded positively to the passage yesterday by the House of Commons of Bill C-11, Canada's new copyright legislation which clarifies the country's copyright regime and establishes a clear legal framework for the digital age and its ever-advancing technologies. It’s older, more experienced teachers – not younger, so-called digital natives – who are experimenting more with new technology in the classroom, a new report suggests. ISTE's NETS for Coaches (NETS•C) are the standards for evaluating the skills and knowledge that education coaches need to guide and support teachers in an increasingly connected and global society. Available now for educators, students and school administrators. If one of your goals for the summer is to improve your knowledge and skills in educational technology, here are ten things that you can do to work toward that goal. The illusion of control is a driving force in many teachers’ daily plans. The fear of losing a classroom of energetic students due to lack of control appears real. Google and 3M give their employees sizeable chunks of time to work on their own projects with intriguing results... could the same idea work in schools? ERDI Fall 2012 | October 10, 2012 | Whistler, B.C. The Defining Moments team is delighted to announce the Top 26 winners of the Defining Moments national arts contest! Join us at ASI 2012 and hear our keynote speaker Nora Young talk about Making Meaning from Information in the Coming Data Boom. It’s out. Michael Fullan’s new book that is. If you haven’t yet had a chance to read Stratosphere then you should. In fact, you should put it at the top of your summer ‘must read’ list, even above that romantic novel you’ve been putting off until summer, or the latest installment of mystery novel from your favourite mystery writer. The reason for this is simply because you’ll need the summer to digest what Fullan has to say about technology, pedagogy and change knowledge. And further, you’ll need to read this book so that you can plan to implement what he has to say into your own classroom, school, district, province or state. The question is however, how do you do that? How can you take the ‘theory’ from Fullan’s ideas and work it into your practice? Below I’ve written about three ideas that you can use to ‘shape’ your way of thinking about your current practice so that you can change your old paradigm into a new one...if you haven’t already! Contact Nord, Ontario’s distance education and training network has released a new report describing how public colleges and universities across the country are providing extensive and innovative online learning opportunities for their students and positioning Canada as a global online learning hub. Students in Commerce and the Queen’s MBA program can conclude their degrees by participating in the Tricolour Venture Fund, the first student-advised venture capital fund in the country. The initiative aims to support the development of a robust venture capital industry in Canada, one that can consistently birth large, innovative companies. A call for communities around the globe to use information and communication technologies to make the world a better place is being heard loud and clear in Canada. Where do graduating students in Canada want to work? LinkedIn conducted some research to find out and produced some interesting results. Here’s a irony: University of Michigan, one of the nation’s premier research universities, is a national leader in pushing teacher-training programs out of the realm of theory to put considerably more emphasis on practical. hands-on experience. When e-textbooks were first introduced, they were supposed to be the wave of the future, and experts thought we’d see e-reader-toting students littering college campuses, and of course being adopted in droves by online university students. Easy A's may be even easier to score these days, with the growing popularity of online courses. Tech-savvy students are finding ways to cheat that let them ace online courses with minimal effort, in ways that are difficult to detect. Pacey is chief operating ofﬁcer at ClevrU, a Waterloo, Ont.-based tech firm, which is set to offer this innovative virtual education as soon as this summer. Not so much a Web 2.0 tool as a wonderful interactive reminder of how infinitesimally small we are compared to the universe. A great piece for use in the science classroom, or maybe in a situation where you or someone around you requires some ‘reality therapy’. Presentista uses the same type of presentation interface as Prezi but with some differences. Join the free beta and help shape what will surely become another non-linear presentation tool that teachers and students will embrace! Themeefy is a Web 2.0 application that allows you to create and publish your own e-Magazines. You can either curate from a wide variety of resources available on the Web or create your own original content. We’ve put this out there before, but it’s worth revisiting! I spent a couple of hours playing with my own emagazine...it became pretty obtuse after a while however! As an educator, you put the learning of your students as your priority. However, this summer it’s all about you and increasing your learning of 21st century education. Here are a few very interesting and easy ways to expand your mind and bring a digital edge to your classroom next year. As the Ontario EcoSchools program takes root at HWDSB, 19 schools have been certified in the second year of the points-based environmental awareness initiative. Insight 7.7 introduces a free Tech Console that makes it easy to manage a computer-based learning environment for IT administrators. 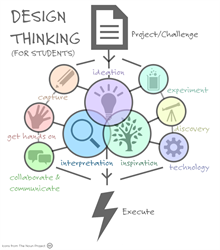 The “design-thinking” process for education championed by IDEO and the d.school at Stanford are a method to problem-solving and improving the learning process from K-12 and especially in post-secondary. Students and lifelong learners who experiment with the design process are often the most inspired people I’ve met in my life. The Fort McMurray Public School District is seeking an applicant to provide partnership facilitation services on behalf of the District and its schools. Service providers will work collaboratively with the District/schools, community based organizations, industry and provincial/federal government departments to continue the work of developing and implementing public and private partnerships and programs to benefit students and families. The Program Manager Teacher Education Programs is located in Rankin Inlet and reports to the Director of Education Programs. The incumbent is responsible for supervising and managing all aspects of community and campus based Teacher Education programs in the Kivalliq and Kitikmeot regions. The Association of Jewish Day Schools (AJDS) is looking for a successful, experienced, educational leader to manage and provide vision to the organisation. “The only sign of life is growth,” my very wise grade 12 high school teacher Mrs. Fogerty wrote in my yearbook.. Funny how some things stick! It sort of became a mantra of mine and with that, I’m pleased to share our emerging services infographic. It captures the essence of our MindShare Learning “Connect to Success” solutions paradigm to better serve you. Innovation has remained our hallmark to better meet the needs of a very complex and fast moving education sector in Canada. Please connect with me if you’d like to explore further with us. Rapid eLearning expert and fellow Pepperdine U alum Tom Kuhlmann (@tomkuhlmann) shares: Three Ways That These 70 Rapid E-Learning Tips Will Help You Build Better Courses. Speaking of Pepperdine, fellow MALT/EdTech master’s alums note we have a summer Alum VirtCamp upcomg in two weeks at the Malibu Campus. If you haven’t registered here’s the link. I’m hoping to see you there. Serious business! ICTC Addresses Skills Shortages at the House of Commons Standing Committee. In order to prepare of future leaders, we need to have a pulse for where the jobs are. Apparently, there is a serious disconnect that presents challenges when national organizations have no jurisdiction on education. Checkout the SIIA Vision Website. SIIA member companies are the providers of the educational content, online services and software applications necessary to power U.S. education in the 21st century. We’re proudly Canadian, hence the puck promo. More importantly, it’s about our mission and message...read it! We welcome your comments! Inspired by Wayne Gretzky’s dad. 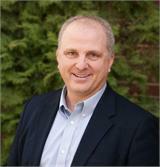 I’m a BIG fan of augmenting listening skills, thanks to my mentor and friend, Dr. Greg Malszecki. Here’s a tweet and link from a Harvard Business Review article: The Discipline of Listening. I love the concept of Google's 80/20 Principle that was adopted at New Jersey School. Has your school or company implemented such as program? I’d love to hear from you. For those of you not wanting to come to terms with the realities of where the textbook publishing market is going. You need to look no further than the sales of hardcover books in the U.S. this past year. eBook Sales Surpass Hardcover for First Time in U.S. Discovery Education has certainly stepped up and taken the innovation challenge as one example. Speaking with Andy Schaefer, VP sales recently, he shared that their new ScienceTechBook has received several District-wide adoptions in Canada. In case you missed it, our Top 10 News stories for June! Bonus Video interivew: Dr. Michael Fullan goes digital with his new book, Stratosphere! A post interview Kodak moment (Left) showing off Dr. Fullan’s book in a digital format! As we put a wrap to our 2011/12 academic year of publishing, we wish you a` safe and enjoyable summer. Until next time, be sure to walk the digital talk! Congratulations to the winners of Canada’s first Virtual Innovative Educator Forum. Each of the winning educators stresses the importance of connecting with a community in order to build the 21st century classroom. We are proud of our teachers who will be representing Canada at the World Wide Global Learning Forum in Athens Greece from November 5 -9, 2012. Good luck in Greece, Team Canada! Canada's Leadership, Learning & Technology eMagazine. 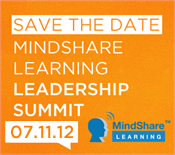 MindShare Learning is a privately held company based in the Greater Toronto Area, Canada. Its hallmark is providing strategic marketing solutions to learning & technology solution providers in the K-12, HED and corporate learning markets, to support new market expansion and revenue growth. MindShare Learning's partial client list includes: Adobe, Blackboard Inc., EPSON, GlobalScholar, Learning.com, RM PLC UK, Softease Ltd. UK, netTrekker, IMSI (ClipArt.com), CERC (Canadian Education Resources Council), Tech4Learning, Xoolon, NECTAR Foundation and ERDI Canada. 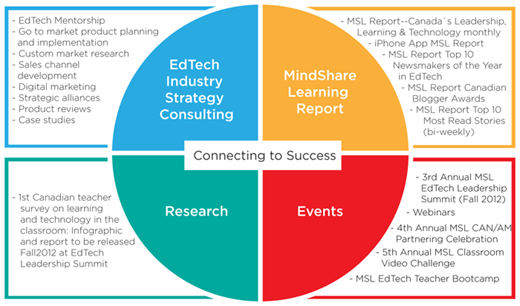 Inquire about our EdTech Strategy Consulting Services.